Origin: Salween River Basin, Myanmar and Thailand. 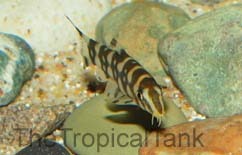 Recommended tank size: 122 x 38cm (48 x 15") or larger. Tank setup: Sand would be an ideal substrate, followed by fine smooth gravel. Use stones and pebbles to vary the aquascape and provide a stimulus to explore. Plants could be included, but bright lighting is unnecessary, so floating or tall overhanging plants could be used to provide shaded areas. Compatibility: Keep in a group of 5-6 or more individuals. Not generally aggressive, although it could nip the fins of long-finned and slow-moving fish such as male Guppies and Bettas. Water chemistry: Soft to slightly hard, pH 6.0 - 7.6. Feeding: Feed a varied diet including bloodworm, brine shrimp (Artemia), mysis, etc, plus sinking granules, preferably including some vegetable component. Sexing: No obvious differences, mature females are likely to have a heavier body shape. 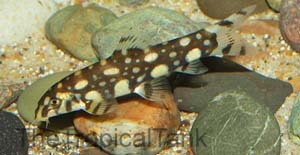 Comments: This strikingly patterned loach is a relatively recent introduction to the aquarium hobby, and was know under a variety of common names before it was formally described. When kept in groups, some sparring may occur as a pecking order is established, but this is not likely to result in harm or serious stress, and will be minimised by keeping in a reasonable sized group.